Elaine is a co-Founder and General Partner of Atlantic Bridge Capital a Global Growth Equity Technology Fund with over $450 million of assets under management, and over $300m of co-investment from Limited Partners. She is also a co-founder of Summit Bridge Capital which is a China Ireland focused Fund aimed at helping Irish companies scale in China. The team and Fund are backed by China Investment Corp which is the World’s 5th largest Sovereign investor with > $585bn of capital under management and Irelands Sovereign Wealth Fund NTMA. Summit Bridge is jointly managed by Atlantic Bridge and West Summit Capital and brings extensive networks in China to Irish companies. Elaine has over 20 year’s operational experience as CFO/COO in scaling technology companies with extensive operational and M&A experience. Previously Elaine was a Co-founder and non-executive director of GloNav Inc, a GPS software and hardware business successfully sold to NXP for $110 million in 2008. Prior to Atlantic Bridge Elaine as CFO and or VP Finance took 3 high growth technology companies public on both NASDAQ and LSE. These three successful technology initial public offerings and secondary offerings for Parthus, IONA and Smartforce on NASDAQ raised more than $1.6 billion in capital. 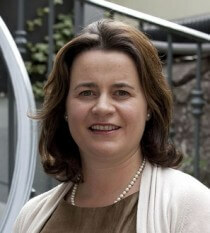 Elaine is a Fellow of the Institute of Chartered Accountants and a qualified Chartered Director. She was named as one of Europe’s Top 100 Women in Technology and appointed by the Irish Government to the Board of Enterprise Ireland in 2014.